Sam Cosgrove (left) and Martin Vicca. Aberdeen striker Sam Cosgrove has been the cream of the crop for the Dons this season. And he proved he can make a positive impression off the pitch as well when he lit up a youngster’s day in the Granite City on Friday morning. 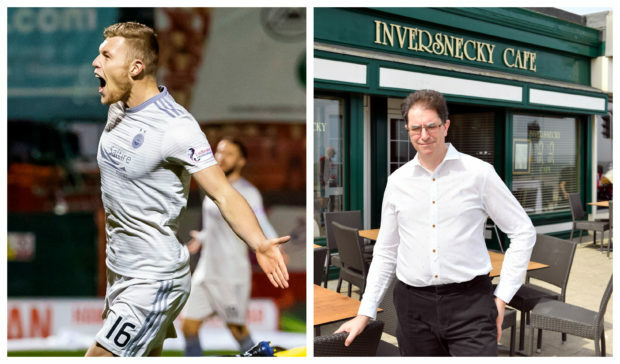 Martin Vicca, the owner of the Inversnecky Cafe on the beach promenade, has revealed how Mr Cosgrove responded to being in the spotlight on his premises. He explained: “I have a new favourite footballer and that’s Sam Cosgrove, who needs recognition. Analysis: What has been the transformation in Aberdeen’s leading frontman Sam Cosgrove? “The whole team were in and they signed a few autographs and behaved impeccably, but then, just as they were about to leave the cafe, Sam saw a young lad, aged maybe eight or nine, eyeing him, but who was far too shy to ask for a selfie. The striker scored two goals in his side’s 4-2 defeat against Rangers at Pittodrie on Wednesday night. But he and his teammates were disappointed to slip further behind their rivals in the SPFL title race. However, the Inversnecky, which is famous for its comic signs outside the entrance, has been a welcoming place for generations of Dons players ever since the days when former manager Alex Ferguson used to take his players there after training sessions on the beach.